First North Wales gourmet golf festival aims for slice of £4 billion a year national market | News by Wales Express News, People Before Profit! Keen amateur players from across the UK are being invited to tee up on four of North Wales’s finest courses in the region’s first-ever golf festival – and enjoy fine cuisine at the same time. The Golf North Wales Festival is a 54-hole event staged over three days at Conwy, Maesdu, the North Wales and Rhuddlan golf clubs at the end of September. It has been masterminded by a top tourist organisation to grab a slice of the UK’s burgeoning £4 billion golf market which is currently earning £258 million a year for Wales. North Wales Tourism is already taking bookings for the inaugural Golf North Wales Festival, which includes three rounds of golf at four championship courses, Conwy, Maesdu, North Wales Golf Club and Rhuddlan. Conwy is a beautiful and testing links which is an Open Championship qualifying course while the BBC’s Voice of Golf, Peter Alliss, twice won pro tournaments at Maesdu which was laid out by the legendary designer and five-time Open champion James Braid. The North Wales Golf Club is a classic links which runs alongside Maesdu while Rhuddlan is a tree-lined parkland layout in the Vale of Clwyd. 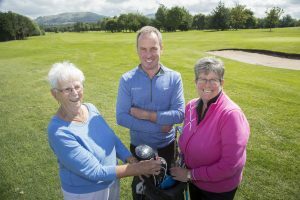 The Festival, which is being supported by the Welsh Government and sponsored Avanti Gas & Power Solutions, will be a Pairs Better-ball Stableford competition aimed at amateur men and women of all abilities. “That’s a massive and growing market that North Wales can be part of and the aim of this first ever festival is to help us tap into that and provide people with an exciting weekend of golf. “The festival will be staged over the weekend of September 29 to October 1 when competitors can test their skills on some of the best links and parkland courses in North Wales. “On day one, the Friday, they’ll play at Conwy Golf Club, a coastal links course which will host the Curtis Cup between teams of the best amateur women players from the USA and Great Britain and Ireland in 2020, and then enjoy a drinks reception, a gourmet dinner and a presentation at the four-star Llandudno Bay Hotel, winner of the Best Newcomer title in last year’s Go North Wales Tourism Awards. “The following day, Saturday, competitors have the choice of a more relaxing game at either Maesdu, which has tee-times in the morning, or have a lie-in to play at the North Wales Golf Club in Llandudno where some afternoon tee-times will be available. “Maesdu is the brainchild of course designer James Braid who won five Open championships in 10 years between 1901 and 1910 and was part of golf’s Great Triumvirate with Harry Vardon and JH Taylor. The seaside club has an 18-hole course with breath-taking views over the Conwy Estuary to Anglesey and Snowdonia. Mandy added: “The festival represents excellent value for money and there are two alternative packages available. “The accommodation package at £249 includes all the weekend’s golf plus two nights’ dinner, B&B at the Llandudno Bay Hotel, while the golf-only package also includes dinner at the Llandudno Bay plus a drinks reception and two-course carvery at Rhuddlan Golf Club. “We’re already taking bookings from people across a wide area. “This is a fantastic opportunity for keen amateurs to try out some of the most challenging golf courses in North Wales in the most beautiful locations. “Meanwhile, our new Golf North Wales brochure puts the spotlight on 14 fantastic courses right across the region. “They include Bull Bay and Holyhead on Anglesey, Silver Birch at Abergele, Conwy, Maesdu, North Wales Golf Club, Conwy and Penmaenmawr, which is a nine-hole course, in Conwy County, Vale of Llangollen, Prestatyn, Rhuddlan and Rhyl, also a nine-hole course, in Denbighshire, Royal St David’s at Harlech and Nefyn & District in Gwynedd and Northop in Flintshire.